And he mentioned that their research team is currently looking into the GPU problem, so I guess is a common problem which will be fixed in the future. I have another problem with the keyboard though - I've noticed that when I double tap very fast a key, it gets recorded only once. And I'm not sure if is normal for this 'mechanical' keyboard or I might just have a faulty one. Could anyone give a try by opening a notepad and try double tapping "ww" and see if they both register? The double tap has to be quite fast. I don't think it's an issue of the keyboard registering the stroke. And I've seen this brought up by a few people on various parts of the internet so far. If I had to guess what's happening I would wager that you aren't allowing the full travel upwards on the key to actually reset the switch and allow the second press to be recognized. I'm sure you will adjust to the travel of they keys the more you use the keyboard. Because I've noticed this myself and have slowly adapted to needing to lift my finger a little higher than I normally would compared to chicklet keys on previous laptops. Go to the keyboard properties and adjust the repeat delay along with the repeat rate. Can you post that exe file? I would like to have that (fan toggle) as the functionality on my OP 17. Can someone tell me if my Temps are too high? 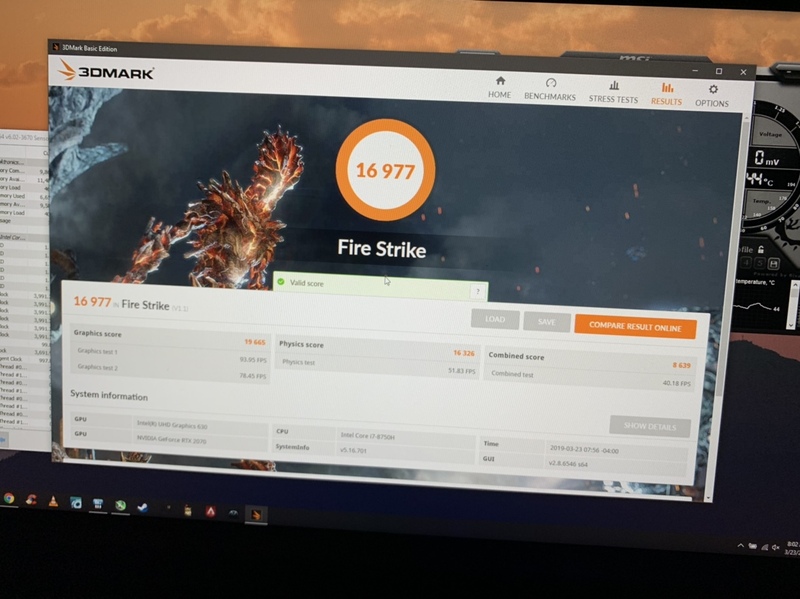 I have the 17" 2070 model with the Master Gel thermal paste applied by Eluktronics. While playing both for roughly 1 hour, my GPU temp sits between 73 and 78. 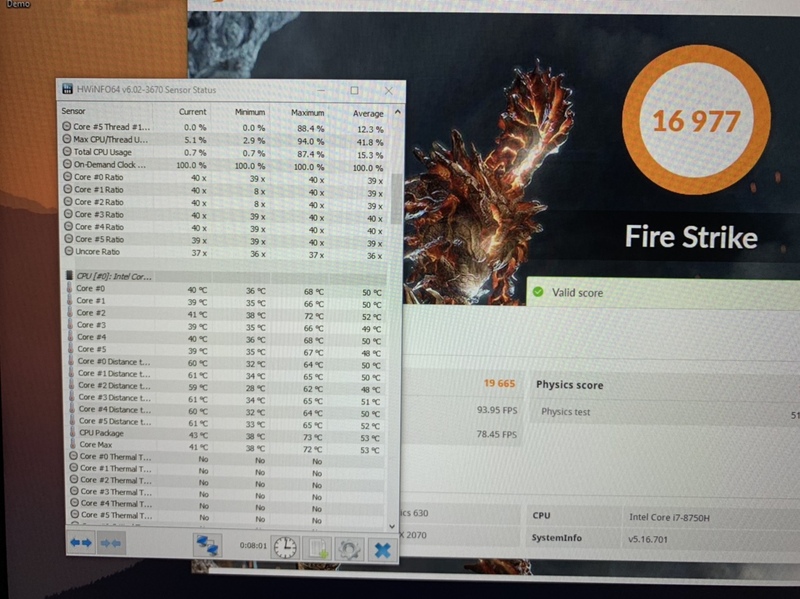 My CPU temp with a -125 undervolt runs between 72 and 77. Does anyone else think the GPU temp is a little on the high side? 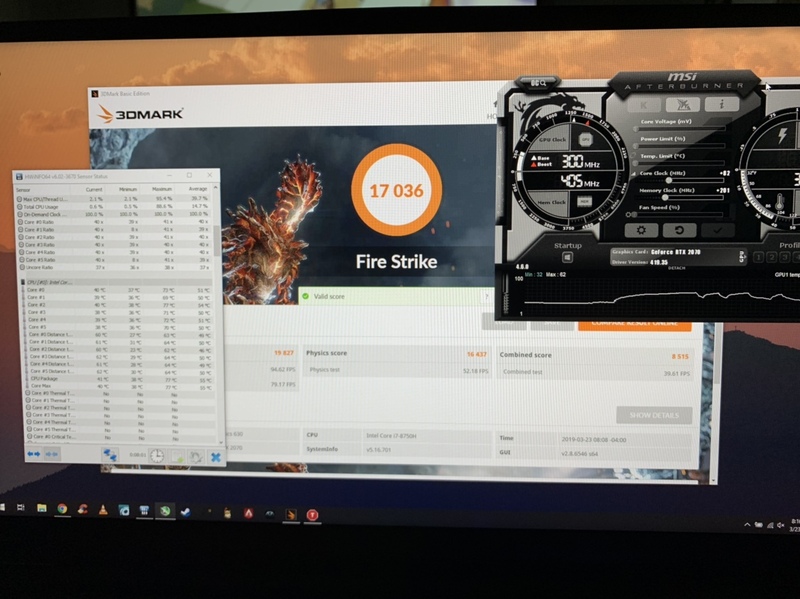 Should I undervolt the GPU as well? Also, are there any settings in the Nvidia control panel I can change to make it run cooler? I have a similar model with a less aggressive undervolt (-50) and with liquid metal and i'm right around 65-74 depending on where i am and the amount of action. Honestly, anywhere in the 70's is amazing. 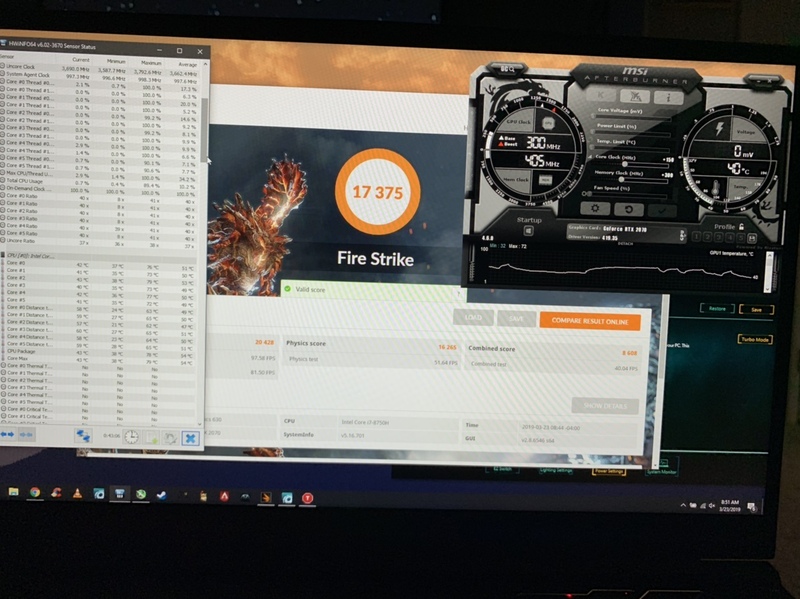 My previous laptop with a 1080 on Apex was running in the high 70's to mid 80's at 75-90 fps. GPU temps are fine. Actually quite good to be honest. You could always try whisper mode in GeForce experience to try and lower temps by limiting the gpu that way if it's really a concern. And I'm not sure what your experience is with the 8750h CPU but that thing runs hot. Any time your chassis can keep it below 80 degrees under load is an achievement. Most laptops will let that temp spike upwards of 90-100 degrees. And I don't think you will thermal throttle until about 96 degrees anyways. You're in a good spot. Also, are you turning the fans to turbo mode manually before playing? I've been tweaking the laptop to see what's under the hood and how much I can get away with. I tweaked the undervolt and some very slight increases in msi after burner. As a baseline my initial test posted a couple days ago right out of the box came in slightly above 16k. I began running into some gpu glitching and just funky performance at levels higher than this on after burner. 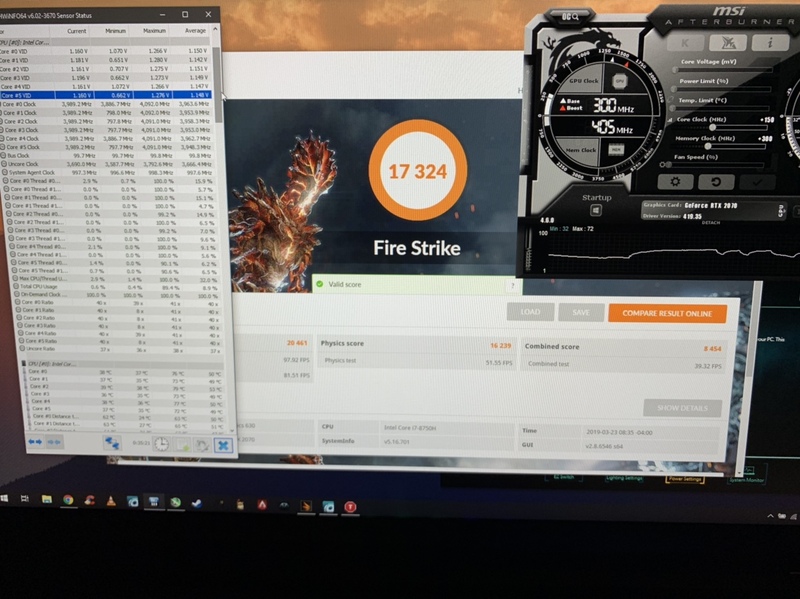 The higher score I've gotten is 17.3k with very reasonable temps. mainly staying around 60 with a spike to 73-79 depending on settings. Has anyone else ran firestrike, would love to see how it stacks up.